In this segment/series of posts, I round up the latest 'news' in dreaming and lucid dreaming from around the internet! I post links to all lucid dreaming/dreaming events (global) I can find during my own online research, but if you have an lucid dream/dream-related event you wish for me to promote, please contact me on Facebook or Twitter (click on the social media link) and I will be happy to help! This is a chance for experienced and novice lucid dreamers to meet up and share their experiences and ideas on lucidity, dreaming and life. Please note that this is not advertised as an instructional workshop. This is a solo show of 24 miniature paintings by the street artist Himbad, who uses his unique 'Sprezzatura method' of secret martial arts techniques. 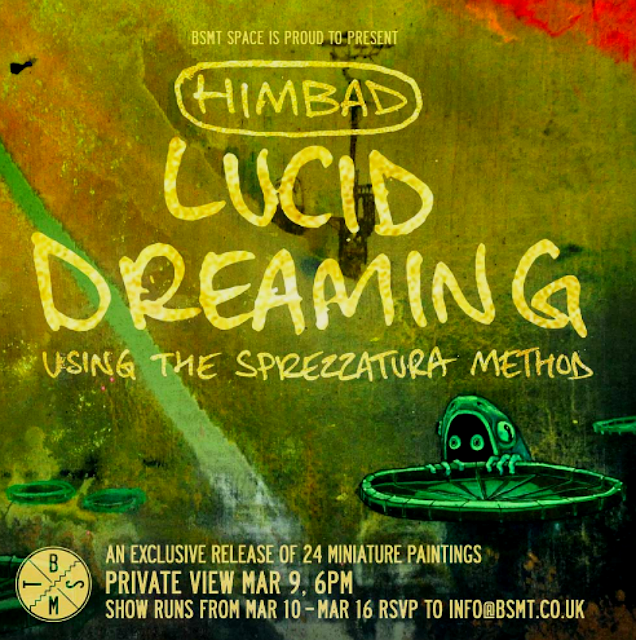 Maintaining a mind state which enables him to access his subconscious, Himbad paints directly from the imagination, creating archetypal imagery inspired by the ancient wisdom schools, alchemy, world mythology and nature. Further information about this event can be found on the website. For more information for this event please visit the website. Please see the website for full information on this event and how to book. 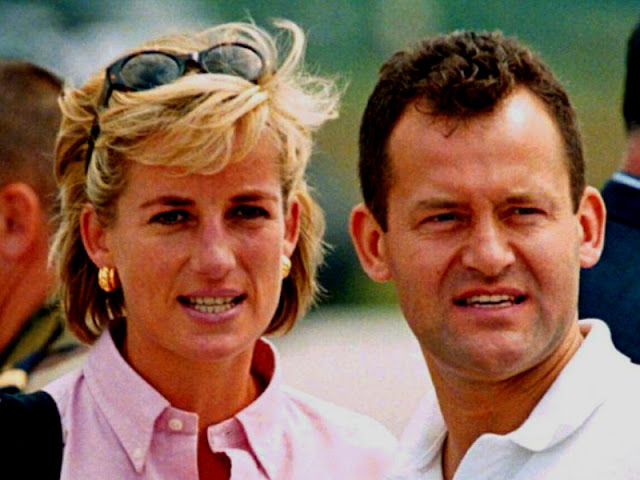 Princess Diana's former butler, Paul Burrell has made claims that she regularly visits him in his dreams, telling him she is 'still alive'. This claim comes just days after Burrell announced he is set to marry his partner, Graham Cooper in April this year, after ending his 32 year marriage to his ex-wife. He states that he yearns for Diana to 'approve' of his new relationship, given that she was the only woman he was able to confide in regarding his secret sexual orientation. Diana would refer to her loyal employee as 'her rock' and he describes the day she tragically died, in a car crash in Paris on 31 August 1997, as 'the saddest day of his life'. Burrell told The Mirror: 'I want Diana to say to me 'it's OK Paul, live the life you've chosen'. But she's not here, so all I have got is her in my dreams'. This is a read-along podcast for Neil Gaiman's classic comic book series, The Sandman, hosted by Joe Fulgham and Sasja Smolders, who discuss each episode, revealing a whole treasure-trove of knowledge and facts about this classic masterpiece! To access The Dreaming podcasts, please CLICK HERE or use the URL: https://thedreaming.moteofdust.com. On 22 February 2017, Lucid Dream, a Korean movie written and directed by Kim Joon-Sung was released. 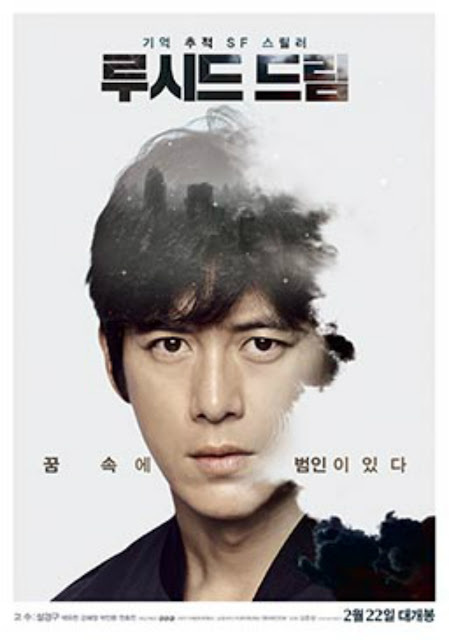 The movie is a science fiction thriller, starring Go Soo as Dae-Ho, an investigative journalist desperately seeking the whereabouts of his young son who was abducted 3 years prior. With the help of a detective and psychiatrist friend, Dae-Ho retraces his memory of the incident using the power of lucid dreaming. The movie is to be distributed via Netflix. An article published online by New Scientist has highlighted the ways in which lucid dreams may be triggered to enable them to be utilised in psychotherapy. The article states that new. consistent methods for inducing lucid dreams are being developed and new scientific innovations are enabling researchers to communicate with lucid dreamers during the dream state, which could lead to therapeutic benefits - people receiving treatment within their dreams. Neuroscience has allowed sleep and dream researchers to confirm that brain activity occurring during the phenomenon of lucid dreaming displays similarities with higher cognitive functions associated with waking states, such as memory, behavioural control, planning and logic. Dreams have often been the focus of psychological therapy and it is well-established that recurrent nightmares can be symptomatic of anxiety, post-traumatic stress disorder and other mental health conditions. Therapy which encourages clients to discuss dreams can provide what Michelle Carr describes as 'an insulated way' to address traumatic subjects and themes. Attempts to 'rewrite' these can help overcome phobias or grief using a strategy known as 'imagery rehearsal therapy' in which the client will rehearse the challenging dream scenarios and confront their nightmares with the aim of changing the outcome. Previous research by Doll, Gittler & Holzinger ('Dreaming, lucid dreaming & personality' (2009) 2(2) International Journal of Dream Research 52) found that lucid dreamers are better equipped at dealing with trauma and tend to experience fewer mental health problems than non-lucid dreamers. Research by Soffer-Dudek, Wertheim & Shahar ('Lucid dreaming & resilience in the face of exposure to terrorism' (2011) 24(1) Journal of Traumatic Stress 125), found that while the female participants in this study who had been exposed to the greatest levels of violence displayed the highest levels of distress, this was significantly lower in those who were able to lucid dream. Ursula Voss states that lucid dreamers often wake with feelings of euphoria and accomplishment and are shown to be more effective at avoiding nightmares due to their enhanced control over their dreams. In a study conducted with colleagues at the JW Goethe University, Frankfurt, Voss was able to develop a technique for inducing lucid dreams - transcranial alternating current stimulation - whereby a low electrical current (gamma wave length) is applied to the frontal cortex of the brain during REM sleep. Results showed that this was successful on 2/3 occasions. More recent research by Holzinger, Klosch & Saletu of the Institute for Consciousness and Dream Research in Vienna ('Studies with lucid dreaming as add-on therapy to Gestalt therapy' (2015) 131(6) Acta Neurologica Scandinavica 355) has found evidence that lucid dreaming can assist in increasing the effectiveness of therapy for nightmares. Holzinger found that clients were able to stop fearing sleep and start to enjoy their dreams. One subject claimed that when they realised they were in a nightmare, they were able to return to an earlier point in their dream, before the threat materialised, and continue their dream in a different direction. This brings a sense of power and control which is at stark contrast with the typical feelings of helplessness and vulnerability experienced in nightmares. Chloe Blanchette-Carriere of the Dream and Nightmare Laboratory in Montreal, Canada, is interested in developing therapies which would trigger lucid dreaming instead of relying on clients having to learn techniques of self-induction; early preliminary studies have shown promising results. The next step is communicating with the lucid dreamer while they are within the lucid dream state, in order to provide 'external support'. It is possible for dreams to incorporate external stimuli from the physical world (such as noise or smells) into the dream content, so it is hoped that techniques enabling researchers to send messages to lucid dreamers will improve the therapeutic potential of lucid dreaming. Kristoffer Appel, a sleep and dream researcher at the Osnabruck University in Germany conducted a study in which he recruited experienced lucid dreamers and monitored their brain activity and eye movements during sleep. Appel instructed his subjects to communicate the fact that they were experiencing a lucid dream by moving their eyes in a left-right pattern which had been pre-agreed before sleep. Once he received this cue he attempted to 'send messages' to the lucid dreamers using audio tones and flashing lights. Out of the 10 subjects, 7 reported the sounds and lights being incorporated into their dream content. In some instances the stimuli were interpreted as occurrences within the dream narrative, whilst in others, the dreamer was aware that the stimuli was a message from the external world. Appel wanted to take this further and communicate in more complex ways with lucid dreamers and so requested that the subjects learn basic Morse code for numbers so that he was able to use a series of audio tones to send simple arithmetic problems to the lucid dreamers, who were instructed to 'answer' using pre-agreed eye signals. At least 3 of the subjects received the messages and were able to provide correct answers. Reliance on eye signals limits the extent of information which can be communicate by lucid dreamers, so Remington Mallett, a researcher at the University of Missouri, St Louis, attempted to use a brain-computer interface which enables the brain to 'talk' directly with a computer. Mallett recruited 2 self-taught lucid dreamers to test the technology, using a headset known as an 'Emotiv Epoc' which is able to map brain activity and then uses these signals to direct different desired outcomes on the computer, for example, moving a virtual objects, such as a cursor. The subjects were first taught how to use the software when in waking state and this was practiced until they were able to attain a 75% success rate, after which the experiment was repeated during sleep. The subjects used eye movements to signal the fact they were lucid; one stated that during his dream he imagined a ninja character moving a block forward, an imaginary action which was replicated on the external computer screen. Mallett describes this process as being like 'a Jedi mindtrick'. This research allows for the objective observation of a cognitive task. Mallett claims that '[i]t's the first step toward being able to convey the content of dreams to the outside world, in real time'. This approach could assist in teaching people to use prosthetic limbs or an exoskeleton designed for those with lower-body paralysis. This has been pioneered by the Walk Again Project, an international collaboration which is led by Miguel Nicolelis at Duke University, Durham, North Carolina. Patients first learn to control an avatar using virtual reality before transferring these skills to send motor signals (from the brain) to an exoskeleton. Harnessing the skills of lucid dreaming would enable patients to exercise their 'mental muscles' every night within the dream world, which would speed their waking ability to control the exoskeleton. Lucid dreaming is also a potential means of utilising creativity - many of us find inspiration or ideas in our dreams which assist or enrich our waking lives. New gadgets, such as the headset used in Mallett's research, could eventually allow us to record material from our lucid dreams. Appel is currently designing a sleep mask which will allow dreamers to use Morse code eye signalling to send messages, in addition to a project based on text messaging using eye signals to control keys. Other promising devices include the Aurora Dreamband and the iBand+, both of which are small headbands using EEG and other biosensors to detect when the sleeper is experiencing REM sleep, triggering LED signals to 'wake' them up and induce lucidity. These devices are paired with an app which tracks sleep patterns and sounds an alarm to wake the user up at the optimal point in their sleep cycle.